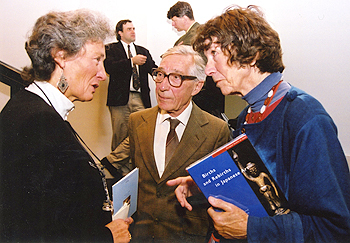 Dr Carmen Blacker was one of the most esteemed Japonologists of our times. Scholar of Japanese religion and folklore, the former Cambridge academic enriched the field with groundbreaking research and publications. After her passing on her birthday in July 2009, Carmen’s legacy – through the help of her husband, Dr Michael Loewe – continues to inspire us today. 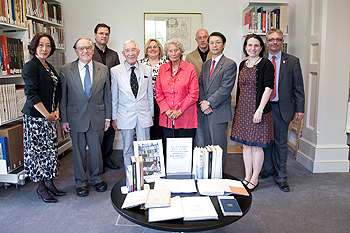 Michael, who is equally a revered yet humble scholar of Chinese studies, has helped facilitate the bequeathal of Carmen’s entire library collection to the Sainsbury Institute. He has been a central figure in the establishment of the annual Carmen Blacker Lecture Series, which invites a senior scholar of Japanese religion or folklore to deliver a lecture in London and Norwich each year in July. As the Institute prepares for the fifth Carmen Blacker Lectures for 17 and 21 July, in Norwich and London respectively this year, we ask Michael Loewe on his and Carmen’s history with the Sainsbury institute, their shared memory of Japan, promoting Japanese studies in the UK and the pertinence of religious and folklore studies in contemporary trans-cultural society. Early in February 1942 some twenty of us assembled in the showroom of the gas company, in Bedford, to take our first lesson in Japanese. We were mainly undergraduates who were reading for the classical studies of Greece and Rome at Oxford and Cambridge. In a course of six months we were to be trained to handle written Japanese, to a degree that would be suitable for the work that was to be our lot, but of whose nature we were as yet ignorant. In August some of us reported to Bletchley Park, to be assigned to the particular section where we would work. On the same day a young girl whom we had never met, and who was wearing a dark blue dress, reported for duty with us. Personally I was directed to the coal face, where we tried to break, and even did break, some of the codes and ciphers used by His Imperial Japanese Majesty’s navy. Carmen was sent to another office; and whereas I benefitted from the intellectual stimulus and discipline that the work required, Carmen’s tasks were those of dreary drudgery, far inferior to work at which she would have excelled. Our paths did not cross very often; perhaps we greeted each other in a highly polite way if we found ourselves seated in the same bus that brought us to the Park or back to our billets. It was thus that, with several years of experience in Japanese texts, I joined academic life in 1956, at the School of Oriental and African Studies, London; and at one time I bore responsibility for teaching the history of pre-modern Japan to undergraduates; Carmen had received her appointment at Cambridge in the previous year. Researching and teaching as I was in the history of China, ability to read Japanese was of immense importance and value; Japanese versions of Chinese works, presented in Kambun style, Japanese commentaries on early Chinese texts and the writings and dictionaries of highly learned Japanese scholars were at my disposal. In those early days it was not possible for sinologists to visit China and collaborate with Chinese scholars, and I owe an immense debt to the Japanese scholars with whom I worked during a year spent in Kyoto (1960-61). I attended the Friday seminars which started at two pm and ended perhaps at eight; it was only after some two occasions that I had learnt to emulate the sensei by ordering a bentō to be delivered to our meeting room. On one occasion in that year we welcomed some visiting scholars from home, including Charles Dunn, a lecturer in Japanese studies at SOAS, and somebody we now had to call Dr Carmen Blacker. In later years Carmen and I foregathered only once in Japan, when she was lecturing at Kansai University. And on another occasion that suited both of our specialities, Carmen was in Kyoto, and I was in Luoyang, each city meriting the title of ‘the Oxford of East Asia’. And just once, I had the pleasure of acting as her guide to Beijing. Degree courses in Japanese studies had been introduced in Cambridge in the late 1940s and full credit must be given to Eric Ceadel – a fellow student at Bedford – for the speed with which this was achieved. Eric himself, Carmen and Donald Keene were the first to be appointed as lecturers in the subject. 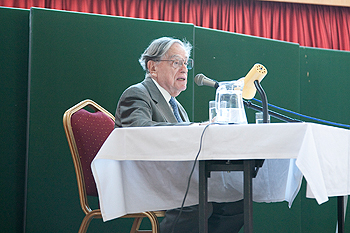 Following Eric’s appointment as University Librarian in 1967, the subject lay in the hands of Carmen, Douglas Mills and Charles Shelford, specialising respectively in religion and philosophy, literature, and history, with the support of Haruko Laurie’s lively instruction in oral practice. When Drs Mills and Sheldon succumbed to the invitation to take early retirement, in 1982, there arose the grave danger that the University would fail to replace them, and would eagerly await Carmen’s retirement in 1991 to close down the subject completely. It was thanks to Carmen’s determination and the strong support of Sir Hugh Cortazzi that ways were found of precluding such a fate and, in fact, of expanding the coverage and place of the subject in the University. Carmen saw religion, philosophy and folklore as key elements in the history of any people, shaping their outlook on life, their habits of living and the relations that they established with others. Throughout her studies she traced the trends whereby these elements affected the contributions that Japan gave to the humanities, enriching the conduct of public life, or how they could lie open to exploitation for particularist interests. She saw for herself the living evidence of religious practice and the customs of folklore in Japan’s countryside; she saw them as parts of the more permanent heritage of Japan’s culture. For, both to Carmen and me, there was no question that the study of religions is of paramount value in a world that is steadily becoming more addicted to secular projects and material values. The conflicts that have sown strife and violence throughout the last few decades have enhanced the need to promote a deeper understanding of the faiths and ideals upon which contesters for power rely to attract the support of a multitude. Equally interested in the Japan of today as that of the past, it was with deep distress that Carmen observed how the vulgarisation or elimination of such parts of the Japanese tradition were growing apace around her. Carmen was well aware of a growing tendency in British universities to concentrate on aspects of Japan of the twentieth and twenty-first centuries. Her response was one of insistence that, to be worthy of the name, an Honours Degree course must include full attention to the humanities. 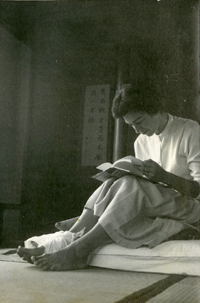 It was in such circumstances that she welcomed heartily the foundation of Sainsbury Institute, with its aims and motives of proclaiming Japan’s contributions to literature and history, art and archaeology to a wide audience. And she looked to the Institute as an institution that would maintain a strong interest in these matters at times when others might be obliged to espouse other causes and expand other interests. She was delighted to observe how the Institute was acquiring its rich store of the technical publications required for research in these subjects. Her co-operation with the Institute rested on her admiration for its combination of two ways in which an interest in these subjects was being developed; by the professional way in which the Institute displays Japanese culture to the public, and by its provision of the fine facilities for scholarly research in these subjects to a degree that is not seen elsewhere in Great Britain. Throughout her career Carmen had been at pains to maintain and foster personal co-operation with Japanese scholars, both in her frequent appearances – usually annual –at universities and monasteries in Japan, or in the warm welcome with which she greeted Japanese scholars who came as visitors to her college at Cambridge. She was an enthusiastic member and at one time President of the Folklore Society of London, and it was aspects of folklore that she chose to teach in the courses that she gave at Ueno Gakuen University in the latter years of her life. She identified elements of belief and practice that were often seen in similar fashion in widely differing cultures, and taught her pupils that it was by studying these that the more permanent values of the humanities can be recognised and cherished. 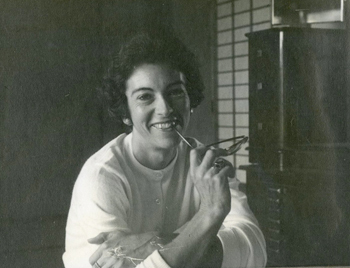 Beginning in the 1950s Carmen had acquired a collection of Japanese publications on her subjects that in time may well have become unique and she was anxious to ensure its preservation in its entirety. Deeply appreciative of Sainsbury Institute’s willingness to accept the collection, she was touched to witness the skill and speed with which Hirano Akira catalogued its items, knowing as she did that they would rest in a safe home.